A few weeks ago I had my 29th birthday. 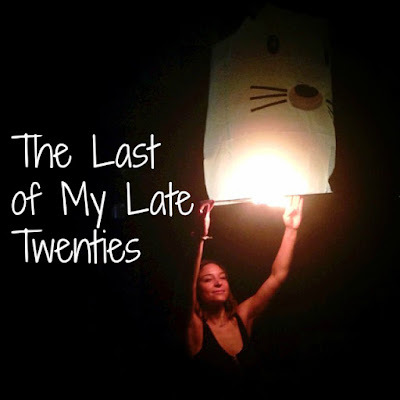 I was filled with mixed emotions; my life does not feel like the life of a 29 year old. I identify with being 27 not almost 30. My career, my personal life, every aspect of my life radiates 27 years young. At 40, I will probably shake my head when I read this blog post. Anyways, now that I am 29, 30 is just around the corner. I mentally put together a list of all the things I think are important for me to master/know by 30. I always hoped I would be mentioned on one of those 30 under 30 lists… I guess I have one more year to rustle up a noteworthy achievement …the pressure is on. When I lived at home I could not believe the amount of money I used to spend on my hair, make-up and clothes, basically throwing all my money away. My girlfriends and I used to shop for a new bar top every weekend, which was totally unnecessary and frivolous. It sounds cliche but think of how many trips I could have gone on with that money. There are a million wealth management books that suggest not putting all your eggs in one basket and learning to create multiple revenue streams. With the unstable economy, there are so many ways to make additional income and while still doing something you enjoy. Start an Etsy Store, create a Freelancer.com account, dog sit, the possibilities are endless. You have the energy now to do more now, why not do it, so you can have money for later. It took me a while to get comfortable with saying no, when someone would ask me to do something I felt obligated to say yes. As I get older, I generally know what I like to do, what I don’t like to do and what I would like to try. I cherish the fact that I learned to be honest and just say, “No, I don’t want to do that at all”, I found it was very important for me to be true to myself. I also learned to let go of FOMO, now when I look at drunken snaps, most of the time I am relieved I don’t have to deal with a hangover. This is true for friendships, lifestyle, basically every faucet of your life. Surround yourself with people that inspire and challenge you. Eat food that is good for you, be educated and know where your food is coming from. Buy high quality clothing and good wardrobe staples so you look polished in your everyday life. High quality fabrics are flattering and fall nicely. I think by 30, self care should be a top priority. I was surprised how many times getting drunk, partying and puking your guts out showed up on the list I read. Although I have been known to “rose all day” every so often (I hate myself for using that phrase), I also like to think I know when to switch to water. I hate getting the booze blues, puking is the worst and it is the most uncomfortable feeling to be the person who got too drunk at the work function and way out of control. By your late twenties, it is time to “know your limits and stay within it”. Earn the respect of the people around you by having a good time but not being uncivilized. The one thing I have heard at networking events and career talks is to take risks when you are young. Take a leave from your job and start your own business, work abroad, or just take time off to travel. If you have no dependents, you might as well use this time to make the most of it. This is still on my list, before 30 I need to take some big risks. My early twenties were so self-involved. I was more worried about what was going on in my friend circle as opposed to paying attention to current events. At some point in your life I think it is important to become worldly, read more and develop strong opinions. By 30 it is time to be pragmatic. High School was a time where everyone was so unsure of themselves, so they ending up judging on another. As I get older, I am comfortable being less surface level and more vulnerable with people. I still have to take a step back, and acknowledge that I don’t know everything and it is okay to be wrong. I have been working at it, but I still have moments where I replay things I have said in my head and feel embarrassed. It has been an hard learning to stop taking myself too seriously and trying to let things go. The self talk in my head can be deafening at times. At this point in my life, 30 is probably not a milestone year, or the turning point I had envisioned. Everyone moves through life differently, and although it is important to be goal oriented, 30 is not the end all be all. If I don’t achieve everything I imagined at 30, there is always 31, 32, 33, 34 or even 35 to get to where I want to be. I am going to spend my 29th year, learning to plan for the future, continue to grow and make more educated decisions. In the comments below, let me know your advice for almost 30 year olds.